Half hidden in a rugged woods east of Mayfield is East Creek Reserve, a lightly used park that includes ridges that rise almost 140 feet above the scenic Boardman River tributary. 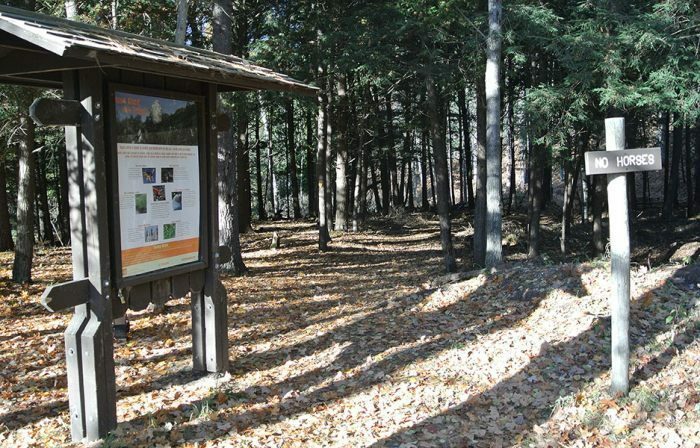 The 560-acre reserve, owned by Rotary Charities and managed for public use by the Grand Traverse Conservation District, was established in 2001 and today features more than 4 miles of trails open to hiking and mountain biking. Passing through the park is the Shore-to-Shore Horse Trail.The reserve is also open to cross-country skiing and snowshoeing though winter access is much more limited. Half hidden in a rugged woods east of Mayfield is East Creek Reserve, a lightly used park that includes ridges that rise almost 140 feet above the scenic Boardman River tributary. The 560-acre reserve, owned by Rotary Charities and managed for public use by the Grand Traverse Conservation District, was established in 2001 and today features more than 4 miles of trails open to hiking and mountain biking. Passing through the park is the Shore-to-Shore Horse Trail. The reserve is also open to cross-country skiing and snowshoeing though winter access is much more limited. Mayfield Road, one of two access roads to the park, becomes Snowmobile Trail No. 510 from December through March and is impassable by vehicles. East Creek’s trail system forms two separate loops connected by a 0.3-mile spur that climbs steeply from the creek bed to the crest of a towering ridge. The perimeter of Mayfield Road loop makes for a 2.2-mile outing, the Wadsworth Road loop is shorter at 1.5 miles. Both are described here as separate trails. Utilizing a segment of East Creek’s trail system is the new Boardman River Trail. Proposed in 2010, the Boardman River Trail will extend 24 miles when completed from Traverse City to the North Country Trail (NCT) at Munice Lakes Pathway. From the NCT users can continue on to connect with the Vasa Pathway and head back to Traverse via the TART Trail, resulting in a 46-mile loop. 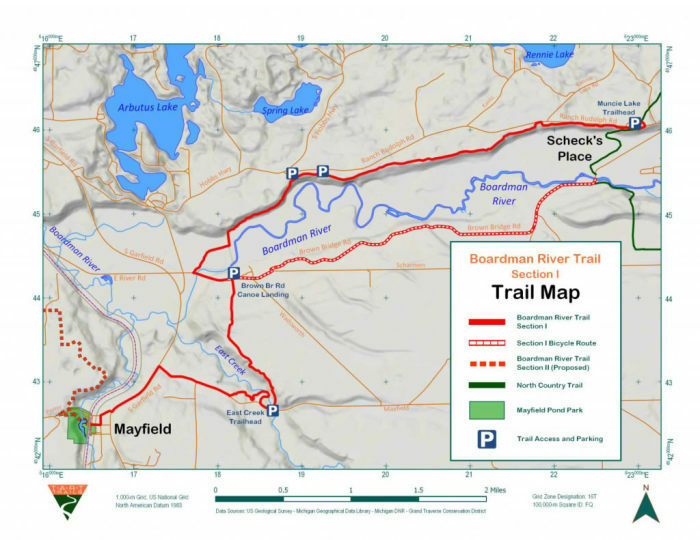 The first segment of the Boardman River Trail was completed in 2013 and extends from Mayfield Pond Park to East Creek Reserve via Mayfield Road. 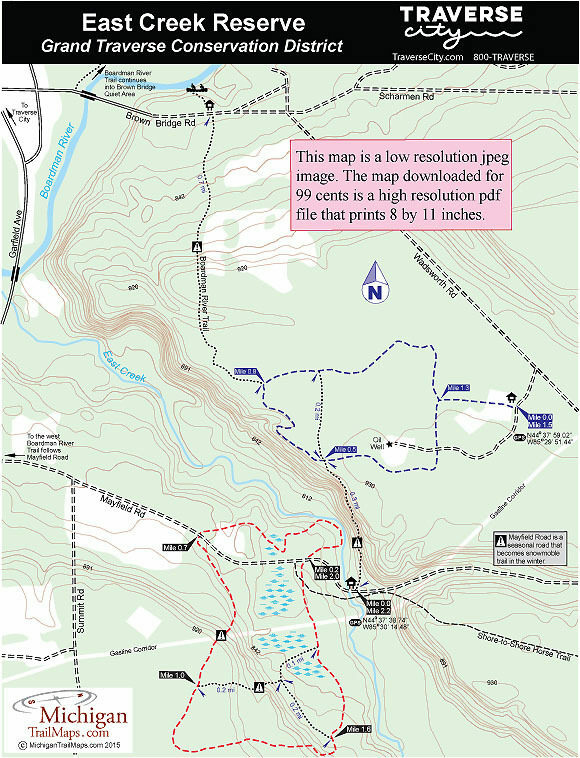 It then follows portions of both of the reserve’s loops, and the steep spur between them, before departing the Wadsworth Road loop and following newly constructed single-track trail north to Brown Bridge Quiet Area. From the Mayfield Road Trailhead follow the dirt road west for a 0.2 mile to the wooden fence that marks where the trail crosses dirt road. Head north (right) as the trail, marked by yellow triangles, quickly reaches the lively East Creek and then skirts it briefly in a very scenic section of the reserve. The trail peels away from East Creek and at Mile 0.7 arrives where another fence marking Mayfield Road. On the south side of the road a level trail enters the woods but within 0.2 mile makes a long climb up a ridge topping out at the open corridor of a gas line. 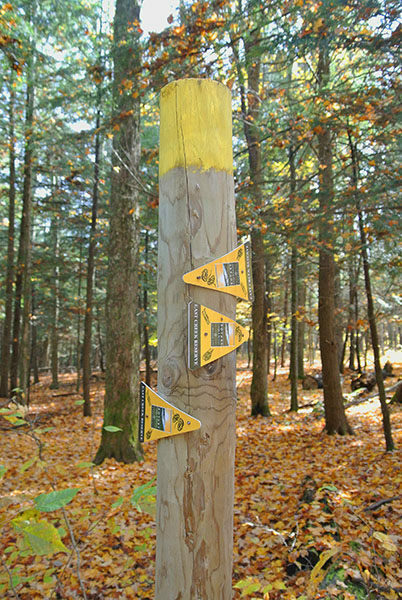 Keep an eye out for the yellow triangle that marks where the trail re-enters woods on the other side of the corridor. At Mile 1 you arrive at a junction. To the east (left) the trail appears like an old-two-track that descends back down the ridge. Continue straight at the junction to head south along another old two-track to follow the perimeter of the loop. This segment swings east to descend the ridge and then at Mile 1.6 swings north to arrive at a junction. Continue north (right) here and the next junction to arrive back at Mayfield Road at Mile 2 just across from where you departed it earlier in the hike. The trailhead is less than a quarter mile to east (right). To reach this loop from the Mayfield Road trailhead follow the trail north as it steeply climbs almost 120 feet up the ridge. It’s 0.3-mile knee bender but it’s amazing to be able to look down at East Creek and realize how rugged this corner of Grand Traverse County can be. If you begin at the Wadsworth Road trailhead this entire hike is level and considerably easier. The trail leads you across an open meadow and then enters the woods to reach a marked junction. Following the loop in a clockwise direction, you head left on the old two-track that crosses the service road to a gas well. Just beyond it the trail departs the two-track and heads west into the woods as a single-track that winds pass the gas well. At Mile 0.5 you arrive at the junction with the spur from the Mayfield Road trailhead. Another trail heads due north here but to remain on the perimeter of the loop follow the trail that hugs the edge of the ridge to the northwest. You can peer down into the East Creek ravine for the next quarter mile until the trail swings away from the edge and arrives at a junction at Mile 0.8. Here the Boardman River Trail heads northwest (left), reaching Brown Bridge Road in less than a mile. Head east (right) and at Mile 1.3, you return to the first junction of the day. The trailhead is less than a quarter mile back across the open meadow to the left. There is little more than a parking area and an information board at either trailhead. East Creek Reserve is open year-round but difficult to reach during the winter. There are no entry fees for visiting the park. To reach East Creek Reserve from Traverse City, head south on Garfield Road (County Road 611) and then east on Brown Bridge Road. Within 0.6 mile turn south (right) on Wadsworth Road. The dirt road to the Wadsworth Road trailhead in reached in 0.7 mile but is not well marked. Head west (right) on it and a couple hundred yards you’ll see the parking area and information sign. Continue another half mile south on Wadsworth Road to reach Mayfield Road. Turn west (right) on Mayfield Road to reach its trailhead in 0.7 mile. 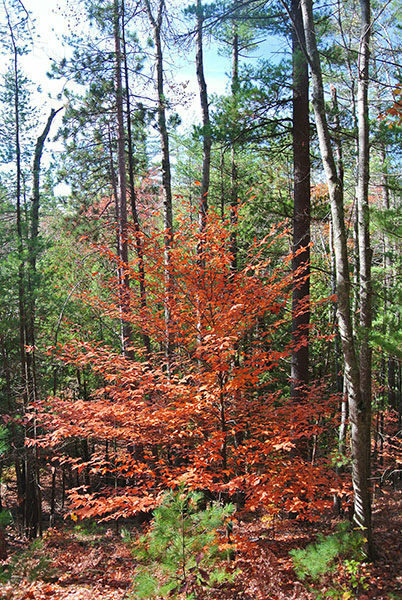 Contact Grand Traverse Conservation District (231-941-0960; www.natureiscalling.org/). For lodging or travel information contact Traverse City Tourism (800-872-8377; www.traversecity.com).